Have you gotten a call from your political party asking for money lately? Fundraising is big business in Washington, D.C. So big, in fact, that your newly elected Congressional representative is expected to spend half of his or her working hours dialing for dollars at a secret phone bank near Capitol Hill. You read that correctly. Actually, more than half their time, sometimes 6-8 hours a day, is spent not working on legislation. Instead, they are essentially full-time telemarketers who are told that their top priority is to raise obscene amounts of money dialing for dollars. All this, during business hours when they are supposed to be working for you, the taxpayer. Shocking, isn’t it? This past Sunday, April 24th, 2016, 60 Minutes broadcast an exposé unveiling the outrageous phone banking operations of an uncontrollable D.C. political machine. It couldn’t be clearer that Washington is more about making money than it is about effective governing. The American public already has a low opinion of Congress. At last check, they had a 14% approval rating yet 90% of them get re-elected. During the broadcast, David Jolly, a Republican Congressman from Florida, claims he was told that his responsibility, as a sitting member of Congress, was to raise $18,000 per day. While legislators and staff are prohibited by law from making fundraising calls from their offices, both Republicans and Democrats are free to do so at party owned call centers down the block. 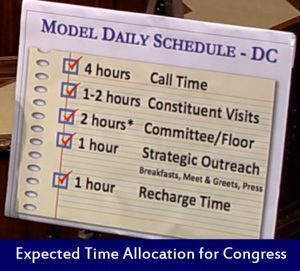 a “Model Daily Schedule” complete with a breakdown of how many hours a day is expected for each of their Congressional duties. Astonishingly, only 2 hours out of 9-10 a day, are to be spent on legislation, the job they were hired to do. This year, Jolly has proposed the “Stop Act” to prohibit individuals holding Federal office from directly soliciting contributions to or on behalf of any political committee. Admittedly, this is not comprehensive campaign finance reform. Jolly states, “This is Congressional reform. Members of Congress spend too much time raising money and not enough time doing their job.” A candidate for U.S. Senate, Jolly estimates the cost to win the senate race in Florida to be $100 million. Whether these revelations by Jolly are a political ploy to win voters this election remains to be seen. According to Rick Nolan, a Democrat from Minnesota, political fundraising quotas are “discouraging good people from running for office. I can give you names of people who would like to go to Washington and help fix the problems but don’t want to go to DC to become a mid-level telemarketer dialing for dollars.” Nolan believes Jolly’s “Stop Act” will be dead on arrival and is not a cure-all that will effectively remove the money out of politics. He believes the bill won’t see the light of day. “Prioritizing fundraising for political campaigns over legislative responsibilities is disastrous for the American people. This reinforces that term limits need to be imposed on members of Congress as a measure to reduce the power of an uncontrolled Washington political machine,” says Nick Tomboulides, Executive Director of U.S. Term Limits. Term limits are a critical piece of the desperately needed “congressional reform” to rein in political corruption. Although not a silver bullet, term limits help move the ball closer to the goal post as part of the overall strategy we need to fix a broken D.C. There is too much money in politics. Term limits help fix the problem of incumbents indefinitely raising money for their next campaign. At a time when Congress has been breaking records for being unproductive, it does not bode well that the only thing in which incumbents excel is raising funds for their next election. The issue of term limits crosses party lines and is exactly what is needed to reduce the influence special interests have on Capitol Hill.